Kozárd is a small Hungarian eco- and gastro-touristic village in a greeny valley in the Cserhat mountains. Full relaxation and culinary events just 50 minutes from Budapest city and 1 hour from "Liszt Ferenc" Airport (Budapest) and close to the border with Slovakia. Lacy House is a beautifully refurbished Hungarian village house, formerly used by an old village family. 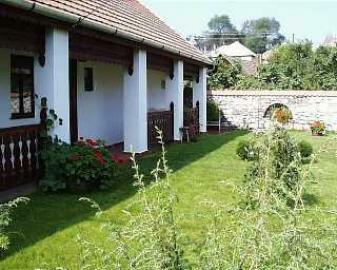 Traditional rural village eco-guesthouse with full comfort (4 sunflowers grade). Connected to the municipal wastewater system. Comfortable eco-furniture in the entire house: living room at the ground floor, two toilets, modern, fully equipped kitchen with gas stove, microwave, coffee machine, extra covered barbecue place outside. One traditional bedroom on the ground floor and two very nice and comfortable rooms above on the 1st floor in the house: one room with 4 beds, and another with a double bed. All nice and clean, with carpets, paintings and artworks. Bathroom with hot water, toilettes and shower. Central heating with individual adjustment possibilities in rooms. You pay € 18 till € 25 per person per night and children get a discount. A garden with grass, green plants and flowers, with pleasant night illumination, large open-air dining area with traditional, wooden-burned cooking facility. Breakfast: local farmer's basket for breakfast available upon request. In summer you can participate in the local traditional jam cooking. The family has their own restaurant in the village, called Wildflower Restaurant. There are marked hiking routes, like the long distance route 'El Camino di Santa Maria', which passes Kozárd and is marked from 2009. Wild boar, deer, muflon and foxes live in this area. Fishing is possible at the Kozard lake (400 m). Kozárd also offers agrotourism and rural festival events, e.g. Apple Flower Festival by end of April, Rural Art Festival in July, Singing Forest open air concert also in early July, Apricot Festival in July and the grandiose Hungarian Flavours-Hungarian Colours Gastronomy and Fruit Festival in mid September. See also www.kozard.hu.